Announcement Hello and welcome to my shop. I'm happy to announce that all of my mugs are now offered with FREE domestic shipping! Beautifully made work of art! The mugs are absolutely gorgeous, and true works of art! I look forward to adding more of these lovely pieces to our collection over the years. 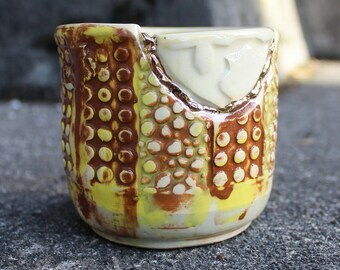 Textured mugs waiting for the bisque (1st of 3) firing. All mugs are now offered with free domestic shipping! Just about 10 more days until I go on summer vacation with my family! I will not be able to ship any items from June 12th to late August. I can still take orders after the 12th, I just will not be able to ship them until I get back. Thanks! All of the functional work here is inspired by "Kintsugi"...the art of repairing with gold. 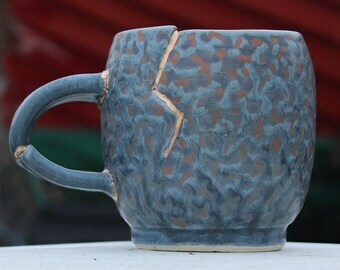 What do you do with a sentimental object when it breaks? Throw it away? Keep the pieces as a reminder of why it was special? I am creating functional pottery that uses these questions as a springboard for inspiration in their design. Refunds will be only be offered if the item shipped is received with a demonstratable flaw (photographic evidence required). Exchanges are offered at the buyers expense for shipping (both the item out and the exchange back). Individual items from sets can be exchanged or refunded at the individual (not set) price. Individual items from sets that are exchanged might vary slightly from the original. I accept payment through all of etsy's approved payment options. Canceled orders will be refunded only if canceled prior to shipping. Any additional fees that may be requested, such as import, customs, tariff or taxes are the sole responsibility of the buyer and not the seller. All items pictured are the actual items to be shipped. Purchased items usually ship within 1 to 3 days. Custom or duplicate items take 4 to 6 weeks. Please message me with any questions and/or concerns regarding shipping. Custom orders are welcome. I have a standard custom order contract for orders over $300 where 1/3 of the total is due up front, 1/3 due in the middle and 1/3 due upon completion. Please contact me for details. I have a wholesale contract as well where my minimum wholesale order is $250. If interested, please contact me for details. Small custom orders are welcome also, no contract required! I do not participate in consignment orders.